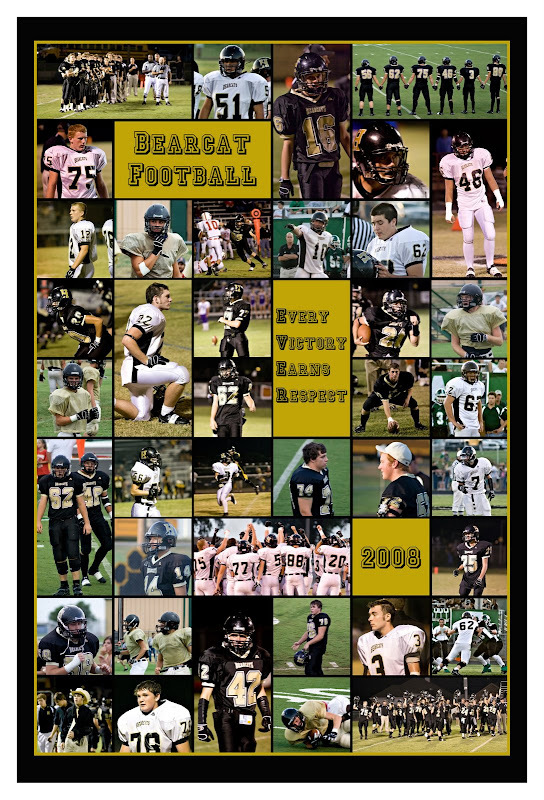 For Christmas, I made a poster-sized collage for Ryan in honor of this year's Bearcat Football team. There is at least one photo of every team member, some group shots, and then just some extras of Ry. I really haven't done many collages, so it took me FOREVER, but then once the template was complete, it was easy to change up, so I was able to do one for a couple of other Bearcat moms! These printed up really nicely, and look great in a frame! Lori, you did a great job on this!! Bet the boys loved them!! I can hear the orders coming in! You did an amazing job! I was one of the lucky Bearcat moms that got one for her son for a Christmas present! I was soo excited and my son was amazed!